Doors - Low level door threshold is standard on our Extra Strong greenhouse - many greenhouses on the market have a step at the door which can be inconvenient. This level threshold is ideal for wheelchair or wheelbarrow access. 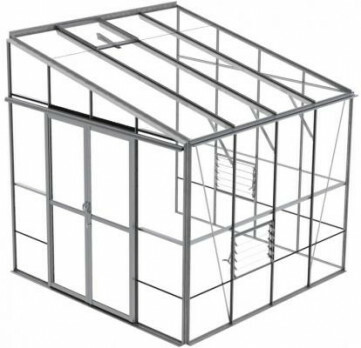 The double sliding doors can be fitted at any side of this greenhouse, and this can be determined at any point up to installation, it is not necessary to advise us with your order. Please note that doors cannot be fitted to the very corners, but can be fitted anywhere else. You can also add an extra pair of doubel doors if you wish, and this can be positioned anywhere around the greenhouse, other than the very corners. For this option please call us on 01749 600014.